26/9/12 - Internet - Databases - Two monographic sites devoted to two of Europe’s greatest painters, Goya and Rembrandt, were recently posted almost simultaneously (on 17 and 19 September). They are slightly similar in design and scope. 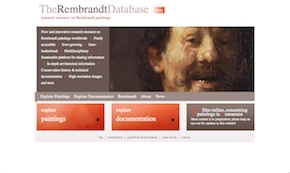 - The Rembrandt Database : the "Rembrandt Database" appears in English. It covers only the paintings (for the moment at least the drawings and engravings are therefore not included in the project), whether by the artist, or only attributed to him or even if the attribution has been withdrawn. This is an international collaboration, initiated by the Dutch RKD, that is the Dutch Institute for Art History, and the Mauritshuis ; there are however, about twenty participating museums and institutes around the world (including the Louvre and the C2RMF in France). It does not attempt, as specified clearly on the site, to replace the Rembrandt Research Project (RRP), a committe which establishes the catalogue of the artist’s works, although the latter’s archives will be made available here. In fact, the database will add continuously to its store of new documents. Athough its stated goal is quite ambitious, the Rembrandt Database manifests only a modest start as yet. The site includes information on only 12 paintings so far belonging to three different museums (the Metropolitan Museum, the Mauritshuis and the National Gallery in London). But this already corresponds to 1,700 documents. By 2014, the database should include works from twenty museums. The website is made up of four parts. The first provides entry via the paintings themselves : each has several corresponding photographs (under normal lighting, x-rays, infrareds, etc,), analysis reports, its conservation history, historical information, a bibliography. Several sections (the bibliography, related works...) are still empty. The second section provides searches for all of these documents via type, for all of the paintings. The third section concerns Rembrandt’s life and has only a chronology for the moment. Finally, the fourth and last section will present the site’s updates on a regular basis. We will thus have to wait a while longer for fuller coverage in order to better evaluate the contents and usefulness of this site. - Goya en el Prado : Presented only in Spanish, the site concerns the works found in the Prado alone, but covers the paintings, drawings and engravings. This is a catalogue raisonné (there are entries for all of the paintings) of the collection, including works with debatable attributions or by followers, copiers and imitators. High definition images are available and users can edit a PDF version of each of the entries for the works. A section is also devoted to Goya’s correspondence, residing at the museum ; for each letter, besides once again offering high definition images, the site provides information on the bibliography, watermarks, inscriptions as well as a transcription. Finally, an important bibliography is rounded out with texts from twenty books and nine articles on the artist published before 1920. More will be added, but more recent articles or works may perhaps not be posted due to copy-right laws. In fact, though it will probably continue to grow this site is already an almost exhaustive source.